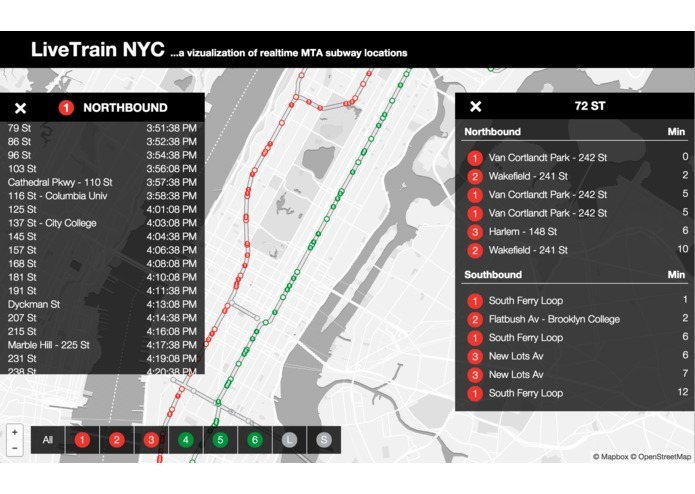 LiveTrain.nyc is a visual representation of subway locations, based on the realtime trip updates provided by the mta. Countdown clocks are great, but we wanted a more visual experience of the New York City subway system. So where are the trains? Lets find out. Commuters hoping to find out when their train will arrive, and when that train will reach its destination, or anyone curious to see the beautiful complexities of the world's biggest rapid-transit system. Trains can be filtered by route, to show only the relevant trains. Users can click on a stop to view upcoming departures. Click on a train to view its up-to-the-minute schedule. Look back to past stops to determine how long a trip took, or look forward to get a clear picture of when a train will arrive. Using the MTA's GTFS-realtime feed of schedule updates and static datasets, we approximate the location and speed of individual trains. This information is made available as a RESTful API, and animated using d3.js and Leaflet/Mapbox. This project was conceived, developed, and maintained by Michael Prude and Ted Mahoney as their final project for the Web Development Immersive Course at General Assembly, a 12-week program in full-stack development. We were inspired by Chris Whong's NYC Taxis: A Day in the Life to visualize another iconic NYC transit option.